G P Dureja, a pain medicine specialist and director of the Delhi Pain Management Centre, attends to 300-400 patients with complaints of back pain every week. If those are the numbers for a single clinic in Delhi, then, it is not difficult to imagine how pervasive the issue of back pain is in India. “Rough estimates show that 80 per cent of the population suffers from at least one major episode of back pain in their lifetime and there is a 22-43 per cent prevalence of spinal pain cases in India,” says Dureja, who previously worked at AIIMS on advanced pain management techniques. In the 2010 Global Burden of Disease study, of all 291 conditions studied, lower back pain ranked highest in terms of disability (years lived with disability), and sixth in terms of overall burden (disability-adjusted life years). The global point prevalence of lower back pain was 9.4 per cent. Disability-adjusted life years increased from 58.2 million in 1990 to 83 million in 2010. What is manifested as back pain is often a consequence of ill health of the tiny bones called vertebrae that encase our spinal cord. The human vertebral column is made up of 33 vertebrae stacked on top of the other. Each vertebra is spaced from the other by tiny cushions called intervertebral disc. Sometimes, back pain can even result in an abnormality in this disc. While it is possible for anyone to be afflicted by back pain, there is increasing consensus that environmental causes, like working conditions, bad posture, stress and sedentary lifestyles often cause back pain (see ‘Six common mistakes to avoid’,). The team looked for a specific pathological symptom called the Schmorl’s node, which is known to be a bony indicator of intervertebral disc herniation. The scientists say that “compared to healthy humans, pathological humans and chimpanzees have relatively smaller neural foramina, shorter, wider pedicles and rounder vertebral bodies”. They also found that “healthy human vertebrae are statistically distinguishable from chimpanzee vertebrae, whereas pathological human vertebrae are not”. The authors believe diseased vertebrae, which are closer in shape to human ancestors, are less adapted for bipedalism—a form of locomotion where an organism uses its two rear limbs for movement. As a result, these ancestor-like vertebrae become more prone to ailments of the vertebral column. They call this “the ancestral shape hypothesis”. Commenting on the study, H S Chhabra, chief of Spine Service and medical director at the Indian Spinal Injuries Centre, New Delhi, says, “The authors have mooted a hypothesis and have carried out a preliminary study. This needs to be substantiated by biomechanical and clinical studies.” He agrees that there exists a range of variation in the shape of the vertebra of humans. For example, the pedicle part of the vertebra is much narrower among Indian populations, compared to their European counterparts. “The paper is strongly biased to the dogma that the human spine is not well adapted to bipedalism. This is not a given: spines are, in fact, well adapted to bipedalism and bone and cartilage have a very strong capacity to adapt themselves to individual mechanical loading regimes,” says Theodoor H Smit, a professor at the department of orthopedic surgery, VU University Medical Centre, MOVE Research Institute, Amsterdam. “This is an old dogma that doctors tell to their patients to make them accept their back pain, but it is not true,” he adds. 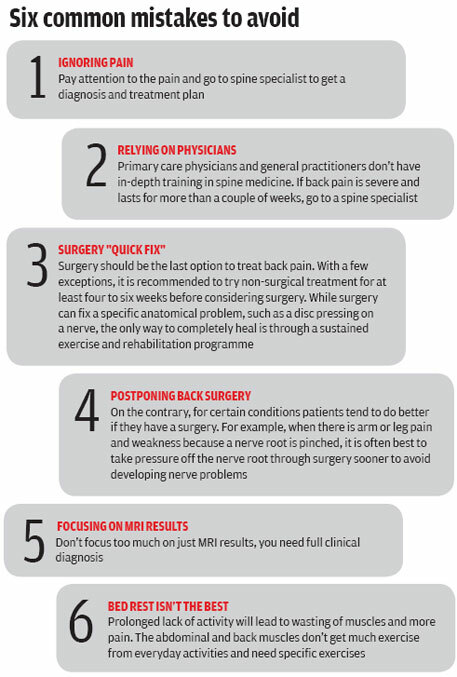 Spine and its functionality are complex issues. Several genetic and environmental factors are responsible for its optimum functioning. With so much contradiction in views among scientists, only further studies on the vertebral shape of live subjects can establish whether or not vertebral shape has a major bearing on spinal problems. Till that happens, all one can do is to stay in good physical shape and create optimum conditions for our spine to function.